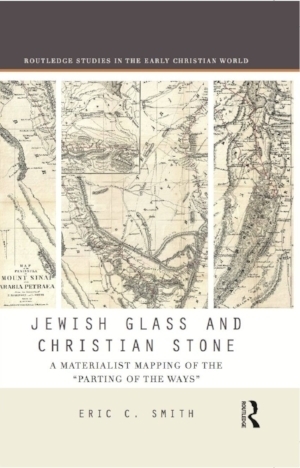 Jewish Glass and Christian Stone published! — Eric C. Smith, Ph.D.
Jewish Glass and Christian Stone published! My second book, Jewish Glass and Christian Stone: A Materialist Mapping of the 'Parting of the Ways' was published in November by Routledge! I'm really excited about this book, and a little excited to see how it will be received. Over the past few decades, there has been a big movement among scholars of Christianity and Judaism (and late antiquity in general) to try to understand how Judaism and Christianity came to be distinct traditions. Christianity, of course, started as a form of Judaism; Jesus, Paul, and probably almost all of Jesus' earliest followers were (and remained) Jewish. But somewhere along the way, Jesus-followers started to distinguish themselves from Jews, and the two groups (which were really a lot more than just two groups) started to be discernible to outsiders too. There has been a lot of scholarship recently that has tried to explain how, why, and when this happened. My book enters that conversation, and tries to add something to it that has been mostly missing so far. Usually, when scholars talk about the "parting of the ways," they do so by reading writings from the period--by bishops and other Christian writers, but also rabbis and even pagan writers. It turns out that many of these writers spent a lot of their energies defining the Other--who they weren't--and in so doing defined themselves. By describing who Jews were, and what they were like, for example, Christians were able to articulate something about themselves. This scholarship has been incredibly valuable, but I wanted to ask a slightly different question. Texts are one thing, but most people in antiquity weren't writing texts. Most people in antiquity couldn't read or write. So I wanted to look at a different category of evidence. I decided to look at material remains from the lives of people in antiquity, to see what it could tell us about their identities. I looked at a lot of different objects, from grave stones to papyrus manuscripts, and I discovered that the "parting of the ways" was sometimes a lot more complicated than the people writing texts made it out to be. Sometimes an object that supposedly belonged to a Christian had Jewish features, and vice versa, and sometimes objects displayed unexpected influences from one side or another. And occasionally, objects had signs that the person who had owned it thought of themselves as both Jewish and Christian--something that, on the basis of our modern categories, ought not happen. But it did happen, and material evidence from antiquity can teach us how and why it happened. For me, this is connected to the present. This book is a work of history, but I think of it as reflective of my own commitments in the present day. The history of Jewish-Christian relations has been a sad and tragic one, to say the least. A lot of violence has been committed over the years--almost all of it by Christians who were persecuting Jews. I wanted to tell this story from antiquity--a story of Jews and Christians who didn't recognize the boundaries we enforce today--because it can teach us to lower our barriers to each other in the present. A little more understanding is a good thing. Travel to Greece with Me!